Two-day one-night stay for two at Hard Rock Hotel Penang worth RM504 per night, for 4 Winners. High tea for two at Thirty8 worth RM150 per pax, for 5 Winners. Dinner for two at Marini’s on 57 worth RM428 per pax, for 2 Winners. Two-day one-night stay for two at The Danna Langkawi worth RM2,260 per night, for 2 Winners. Purchase one (1) bottle of the participating products; either Cactus Natural Mineral Water 300ml, 500ml or 1500ml bottle. Scan QR code under the bottle cap with a WeChat-preferred scanner. Each QR code is unique and equivalent to one vote. First-time user must register with their personal details. Participants must vote to be eligible to win the three (3) Grand and/or thirteen (13) Special Prizes. 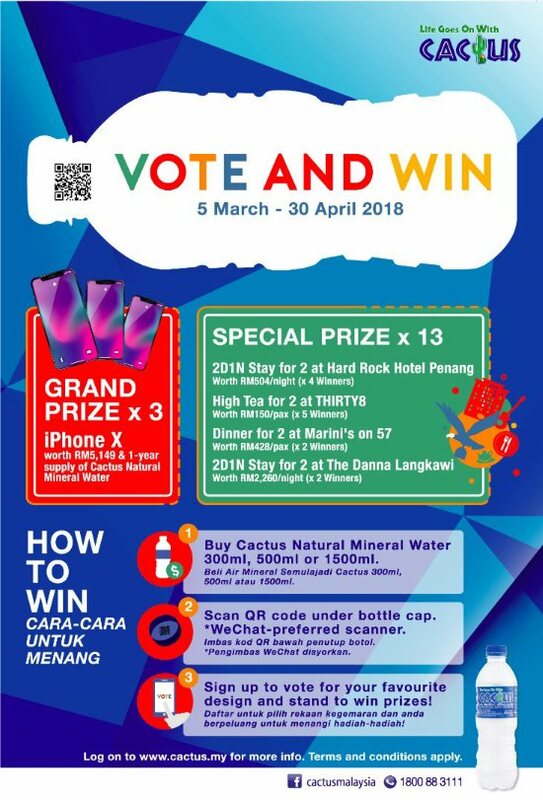 The three (3) Participants who voted the most throughout both voting stages will each win the Grand Prize of an iPhone X worth RM5,149 and a 1-year supply of Cactus Natural Mineral Water (31 cartons of Cactus Natural Mineral Water 1500ml). The thirteen (13) Special Prizes Winners will be determined through lucky draw. Visit Cactus Natural Mineral Water Label Design Vote and Win Contest terms & conditions for more details.